Dubai Desert Safari is a must-have experience recommended for everyone. Here's my review of this amazing trip to the Dubai Desert. 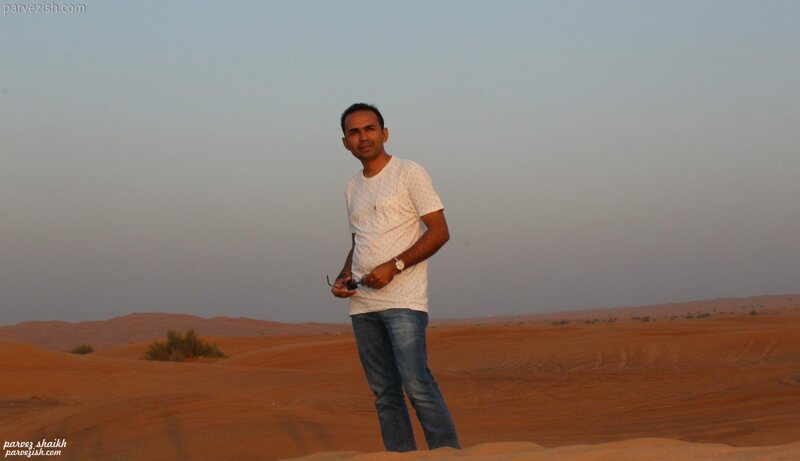 A trip to the beautiful desert is a must while visiting the emirate of Dubai. While Dubai is full of tourist attractions and activities, it’s worth escaping from the city life to find peace in the desert. 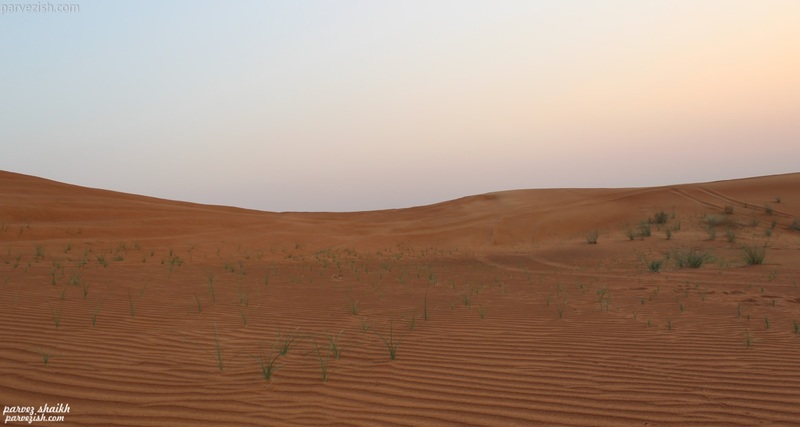 Desert Safari is one of the must-do activities in Dubai and in this review, I will share my Dubai Desert Safari experience. Desert Safari is organized by licensed tour operators, who arrange everything from pickup to food and dropping back at your place. The whole activity takes about 6 hours to complete. In these 6 hours, you are picked up from your place and taken to a camp deep in the desert. This is where you enjoy different performances and food among other activities. You are dropped back at your place at the end of Desert Safari trip. Desert Safari can be booked online in advance. I booked Red Dune Desert Safari with BBQ Dinner online well in advance before my arrival to Dubai. The confirmation was immediate – which was sent to my email. Upon reaching Dubai, I emailed the tour operator Dream Journey Tourism to let them know in which hotel I was staying. This is to be done at least 24 hours in advance to make sure the operator knows your pickup location. I received a response in just 5 minutes – confirming my booking and letting me know the time I would get picked up from my hotel. On the next day, I was waiting in hotel lobby and my driver came right on time to pick me up. The driver Mohammed Shafi (I hope I got the name right) was polite (but didn’t talk much) and well behaved. After he picked me up, we drove across nearby streets to pick other members up and soon began our ride to the desert. Our first stop was quick and didn’t include driving in the desert. This is where the driver deflates the car’s tires while guests enjoy riding a quad bike in the desert. Quad biking is optional and not included in the booking price. You are supposed to return to the car in about 20 minutes. The second phase involves riding in the desert. The ride is full of ups and downs and is a lot of fun. Sailing on this silky sand in a 4×4 car is a wonderful experience. You might want to carry a vomit bag if you feel like throwing up during this bumpy ride. After some time, we stopped to take photographs of the beautiful desert. The driver offered to take photos of us in our camera and phones. Travel tip: Observing the sunset in the desert is an amazing experience of its kind. This is the best time to sit on the silky sand, close your eyes and feel the peace around you. Oh boy, you feel so relaxed! We took lots of photographs here till the sun finally disappeared in the desert and took a long ride to our camp. The Bedouin-style camp deep in the desert was our final stop. Our tables were set around the center stage – where different performance took place. There were three different type of performance presented in front of us. These performances were namely: Fire show, Tanoura dance and belly dance. All three performance were worth watching. After enjoying performances, it was time for dinner and I can’t tell you how excited I was! The BBQ dinner buffet included both vegetarian and non-vegetarian options. Right after the last performance finished, it was announced that the dinner was ready and almost everyone literally rushed to the buffet – creating a chaotic scene. It was a long queue at the buffet but I thought the food will be worth the wait. When I finally got my hands on some food, I was disappointed by the quality and taste of everything I ate. The food was cold and its taste was not taken care of. The non-veg starter finished up quickly – leaving everyone else with the veg option. Unlimited water and soft drinks were included in the price. You will be able to enjoy a short camel ride in the desert which is included in the price. You can smoke shisha pipe for free in the hookah zone. Shisha pipes served at your table are chargeable, though. You can get a falcon sit on your hand and get your pictures taken with it. This is also chargeable. Ladies can get their hands painted with henna for free. You can also enjoy alcoholic drinks – which are charged separately. 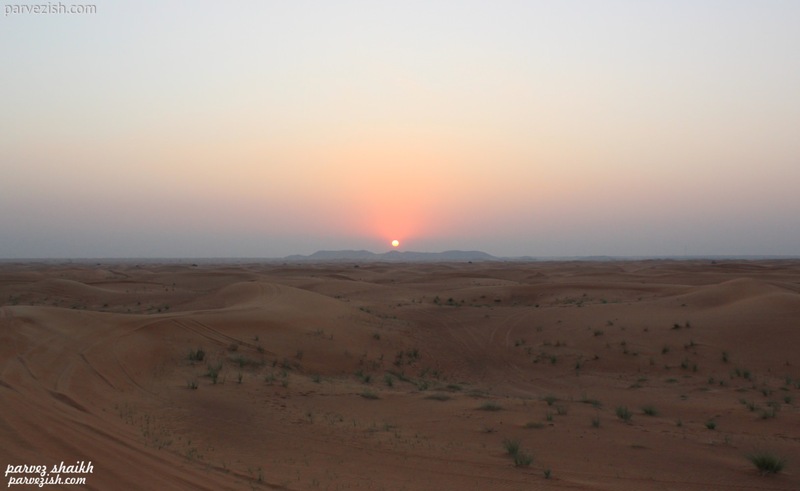 Everything about my Dubai Desert Safari trip was wonderful – with an exception of food. I heard fellow visitors saying the food was worth the money we paid for, but I didn’t quite agree to that. The long ride in desert was an extremely pleasant experience. Dance performances were worth the time and money, too. 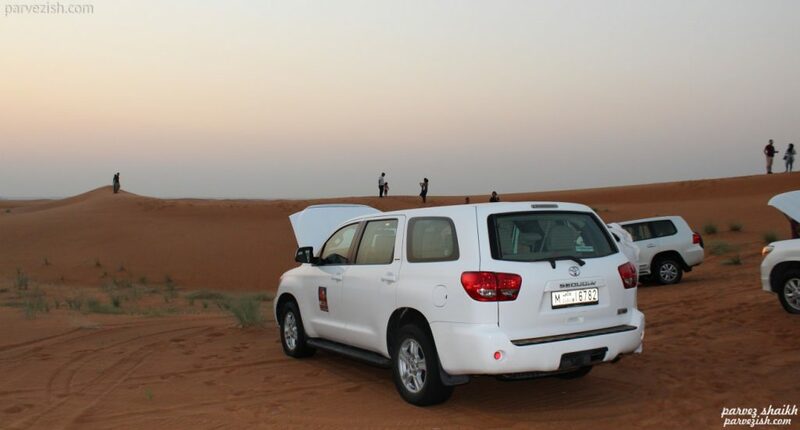 The best part of Dubai Desert Safari was to sit back and relax in the desert while observing the sunset. If you are planning to go on the Desert Safari adventure, I suggest you choose the evening time. Evening time allows you to enjoy the beautiful sunset at its best. Travel tip: You should book your Dubai Desert Safari activity in advance for more convenience and to avoid last-minute hiccups. Make sure to contact the tour operator by phone / email in advance to confirm your hotel and room number and the time you will be picked up from there. That’s it, folks! 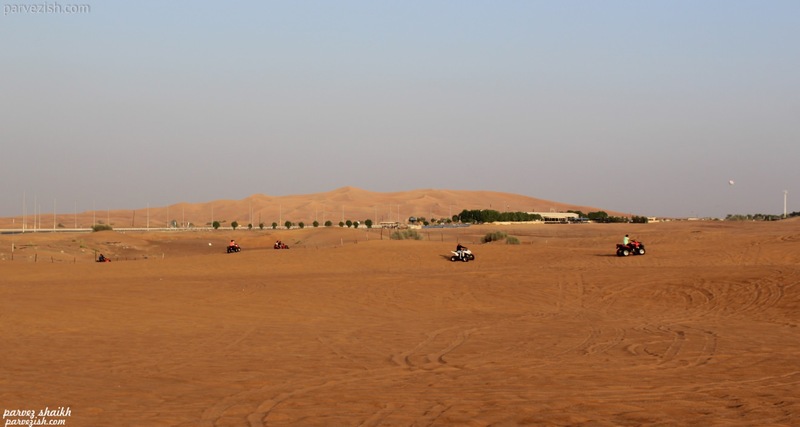 This was my review of Dubai Desert Safari – a must-do activity while in Dubai. I hope you enjoyed this review and have as much fun as I did in the beautiful desert of Dubai. 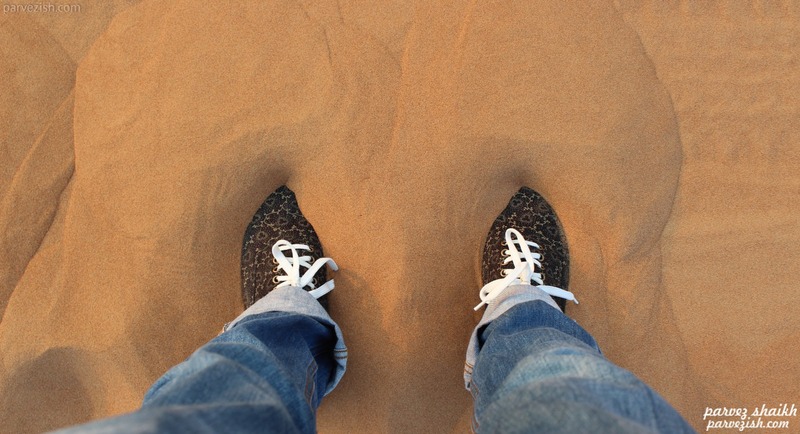 I would love to know about your Desert Safari experience in Dubai – or anywhere else. Feel free to add your comments, feedback and suggestion. I will be back with more adventures soon. Until then, this is Parvez signing off. Right from my pickup to a ride to the desert – everything was excellent. I wish the food was as good as the rest of the activity, too. Nonetheless, Dubai Desert Safari is a must-have experience recommended for everyone.